If you are like me, you love to run. I love it because it is so easy to do. All you really need is a good pair of running shoes (or not if you like barefoot running). I can easily make running part of my weekly routine and schedule it around whenever is good for me. It is a great excuse to get outdoors and enjoy some fresh air and I can do it anywhere or anytime, even when I am travelling. One of the things I love to do when I am on vacation is to get up early before it gets too hot and run barefoot on the beach. It feels awesome! Running gives me lots of energy and I feel great. It is a great stress reliever, but the real magic happens when everything is in sync—our mind and body are relaxed and we experience the sheer pleasure of running. Our body seems to move effortlessly and in perfect form. The time and miles pass quickly. This is the addiction for runners. This is why we run. This is our drug! I want to keep running for a very, very long time—actually my goal is to be running injury free for the rest of my life. I want to run and train without experiencing pain and injury. If I am training hard and running long distances, I want to feel good both during and after running. I want my body to work the way it was meant to work -- strong, relaxed, efficient and pain free, like a well-oiled machine...like a peaceful runner! If you feel the same way that I do about running pain and injury free, keep reading and you too will soon be on your way to running injury free NOW and for the rest of your life! I used to be a regular patient of physiotherapy, massage therapy, and chiropractic medicine—all of which were helpful in dealing with the soreness, but I didn't want to just treat the soreness—I wanted a permanent solution!! I wanted to run easily and without pain, so that none of these treatments would be necessary. Most running sites concentrate on the traditional methods for preventing and recovering from injuries. This site is different. We will help you learn how to use your own mind and body to prevent and recover from injuries. You will learn how to run mindfully, develop your awareness of how your body moves, how to best deal with running pain, keep your body relaxed, strengthen your mind/body connection and much more so that you can understand where injuries come from and how they can be prevented. There is a strong connection between the mind and body where optimal energy and wisdom can be accessed. We can learn how to use our minds to teach our bodies how to move efficiently and effectively, resulting in...running injury free forever! 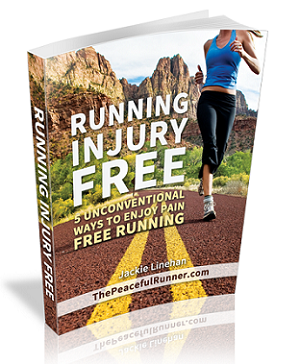 The best place to start is to download my free book: Running Injury Free: 5 Unconventional Ways to Enjoy Pain Free Running. In this book you will learn how to prevent running injuries, how to deal with running pain, how to recover from a running injury faster and much, much more! You can implement these steps and strategies to greatly enhance your chances of never having another running injury. Let your journey to becoming an injury free runner begin right now!! Click below to subscribe and you will have instant access to download my book and a number of other freebies! A Happy Runner is an Injury Free Runner! Our life experiences are not always happy. If we don't know how to properly deal with and release our emotions during these stressful events, they remain in our bodies until a later time when the body feels it is safe to release them. Unfortunately for runners, these suppressed emotions often show up as running pain and running injuries. We need to learn how to deal with these sensations in a positive way and allow them to easily move in and out of our bodies. Negative thinking is another reason runners get injured. When we allow negative thoughts to take over, we feel down and depressed. This negativity creates stress and tension in the body—the perfect conditions for an injury to develop. Have you ever had a negative run? I bet it was one of the most difficult runs you ever had and I bet your body felt very tired and sore afterwards. Much of how our body feels is related to our thinking. We need to keep our mind happy in order to keep our body happy so that we can keep running injury free! The 10 Most Powerful Life Changing Affirmations for Runners Program can help you be happier, stay positive and run injury free! Meditating while running can really help you tune into your body's capabilities. It will also help create more peaceful and enjoyable runs while improving running ability, reducing injuries, improving ability to stay in the present moment, increasing body awareness and calming your mind. 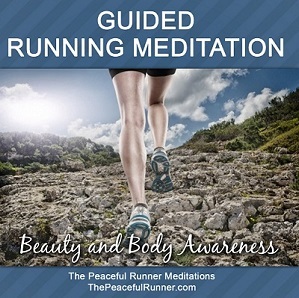 Meditation has so many benefits and you can now practice it while running! When I first started running, my body would really hurt after running long distances. When I trained for a marathon in 2008, I experienced tremendous soreness in many parts of my body. When arising in the morning, it was difficult to move as a result of the stiffness in many of my joints and the numbness in my hips. I knew if I didn't change something soon, it wouldn't be long before I would have a serious problem. I was determined to continue running and to find a solution. Since then I learned how to keep my body pain-free using various methods. I learned how to move my body in the most efficient and most effective method through the Feldenkrais Method. It helped me develop a strong sense of body awareness which I believe is a key part of staying injury free. Previously, I would need to stretch all the time after and before running and even on days that I wasn't running. I was trying to relieve my stiff, achy muscles. These days, I never stretch. I don't feel the need to stretch anymore. Running doesn't hurt my body anymore since I have learned to access and use mind and body awareness. I also use positive affirmations to stay positive and I have learned how to relax while running. As a result of my efforts I am not only running without pain, but running has become more enjoyable and I am running more efficiently and using less effort. 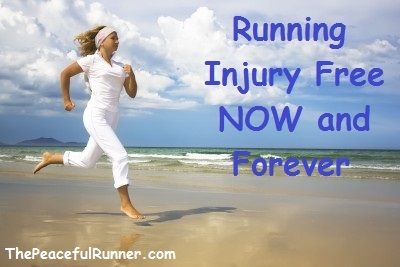 I hope you will join me in my pursuit of running injury free forever! Sign up for The Peaceful Runner Newsletter to ensure you don't miss out! Get all the inspiration and running motivation you need as well as the latest news from this site and the rest of the running world. Be sure to "LIKE" our Facebook page once you get there! Feel free to add comments and share them with your friends! Be sure to log in to your Facebook account in order for your "LIKE" to show on your Facebook wall. Check out the Peaceful Runner Club.